The island with the most beautiful beaches. 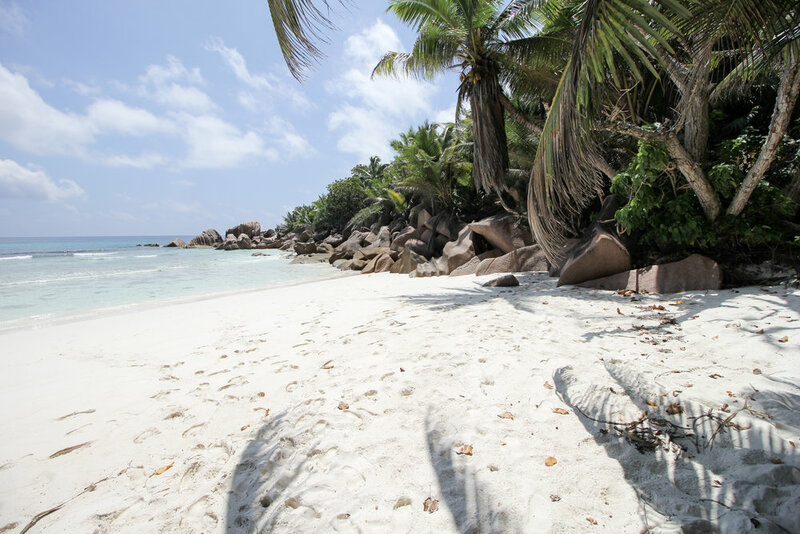 We can't say that with 100% certainty because we haven't visited all 115 islands in the Seychelles, but La Digue is home to Anse Source d'Argent, one of the most photographed beaches in the world, and we pretty much fell in love with all the other beaches as well. 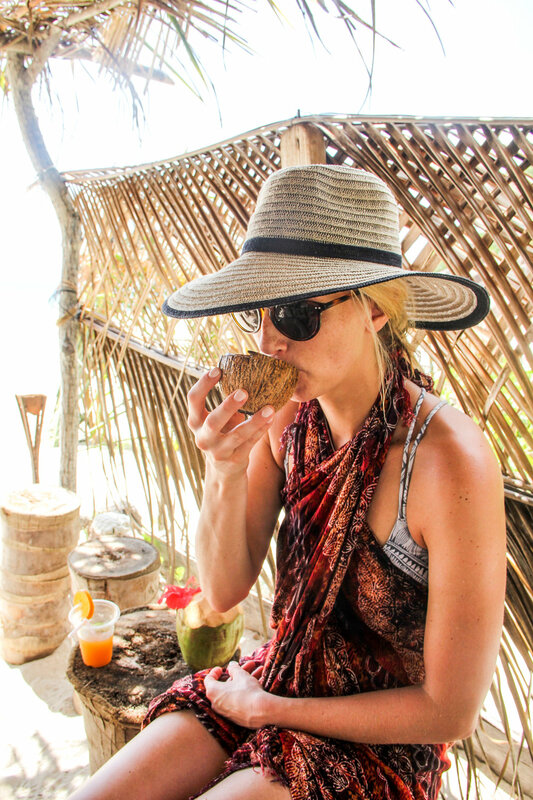 Anse Coco is a must and was the proclaimed favorite of every local we spoke with. What makes La Digue even more charming is that most everyone gets around by bicycle. Imagine biking along a coastal road lined with giant boulders and clear, turquoise water. It really doesn't get much better. La Digue Island Lodge | This is the place to stay if you romanticize about your own charming A-frame on a stunning beach (we saw a turtle, lion fish, a spotted eel, and lots of fish when snorkeling right off the beach). The friendly staff, outdoor showers, front patios, and breakfast overlooking the ocean make La Digue Island Lodge a relaxing, reasonably priced (for the Seychelles) option for your stay. Side note: While the rooms are a little dated for the price you pay (think a 3 star hotel in Europe for a 4 star price), they were immaculately clean, the beds were comfortable, and lodging in the Seychelles is simply more expensive. Don't be deterred by what you read on TripAdvisor! WATCH THE SUNRISE AT Anse Source d'Argent | Anse Source d'Argent claims to be "one of the most photographed beaches in the world" and while I'm not sure how they could possibly track that, pictures of this beach are what drew us to the Seychelles in the first place and it was truly spectacular in person. Giant boulders with weathered vertical grooves scattered on a white sand beach with palm trees as a backdrop. The beach itself lies within the L'Union Estate, which requires a 100 SCR entrance fee per day, and since this is a popular beach we recommend going there for sunrise. The Estate technically isn't open before 8:00am, but there will be someone at the gatehouse at 6:00am and you can ask/suggest to them that you pay the entrance fee before you go in and then get your ticket from the ticket lady when you leave. They were okay with this the two days that we went for sunrise and we had the whole beach to ourselves (bathed in the best light!) until the Estate opened at eight. HIKE Grand Anse to Anse Coco | While Anse Source d'Argent delivers on scenery, it's not much of a swimming beach, and since it's the most well known beach on La Digue, it can get quite crowded to hang out there all day. Anse Coco on the other hand, requires about an 800m hike from the nearest road which filters out a good number of visitors. Grand Anse is beautiful in its own right and then you'll pass through Petit Anse (where we stopped for fresh coconuts and juice) and finally end up at Anse Coco. Bring your snorkel gear, bring a picnic, and hang out here all day. 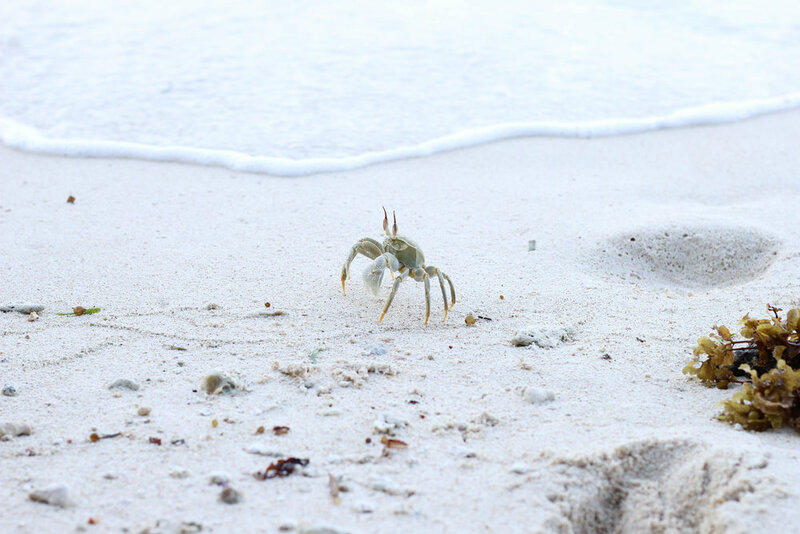 If you walk to the far end of the beach at high tide, you'll be rewarded with a natural swimming cove surrounded by the boulders that have made the Seychelles famous. VISIT RESIDENT TORTOISES AT Anse Severe | Two sweet wild tortoises live at Anse Severe by choice because they love all the attention they get from tourists. The tortoise we met just off the road was so accustomed to being fed by hand (even though it could have eaten the same greens we were feeding it), that if we stopped petting or feeding it, it would move forward and nudge us to continue. Be still our hearts! BIKE TO Anse Fourmis | The road ends here. A bike to Anse Fourmis means you will have seen (and hopefully relaxed) at all the road accessible beaches on the north and east sides of the island. Located on the other side of the peninsula that you see at the end of Anse Coco, a bike to Anse Fourmis effectively completes your beach loop on La Digue, and offers breathtaking scenery along the way. Belle Vue | Skip the hike you read about to Nig d'Aigle (its mostly a road anyway) and instead book dinner at Belle Vue. 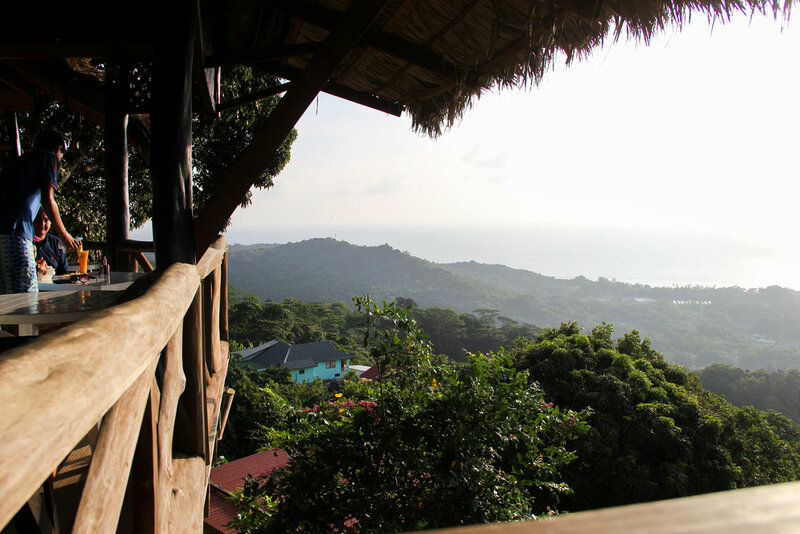 They'll pick you up at your hotel around 5:00pm, drive up the steep, curvy road and serve you a delicious Creole dinner overlooking the island while the sun sets. Fruit bats fly above the jungle that eventually meets the sea below your perch at Belle Vue. Our dinner started with a fresh fruit and rum cocktail, followed by fried breadfruit, still warm from the fryer, a fish salad of raw sliced fish, cabbage, and peppers (no dressing needed), basmati rice, fish fingers with just the right seasoning that no dip was desired, a lentil puree, vegetable curry, honey barbeque chicken wings, finished with a whole grilled smoked white fish, sweeted with lime and flavorful from the charcoal. After dinner, the restaurant drops you back off at your resort. Hands down our favorite meal of the trip. Le Repaire | We loved the dining experience at Le Repaire so much we came back twice. Set at the bottom of a small boutique hotel with a string light lit patio and art from local artist George Camille hanging on the walls, this Italian restaurant has friendly staff, a tasty wine selection, and homemade pastas. With the limited restaurant options on La Digue, Le Repaire quickly became one of our favorites. Bike! Most everyone here pedals around the town on two wheels and it's a wonderful way to explore the island and pair some activity with your beach time. We rented our bikes through our hotel (La Digue Island Lodge) for $10 USD per day. You are going to drop some cash here. When we made a comment at Petit Anse to the two locals selling a small cup of juice for $8 USD that $8 USD was pricey for a juice on the beach, they scoffed and replied, "These islands are the most expensive islands in the world." The island of the Coco de Mer. Praslin, pronounced "pra-LIN", is one of two islands where the tree that produces the largest nut on earth, the coco de mer, grows naturally. You can view this majestic plant in all its glory at the Vallee de Mai, an impressive nature reserve and UNESCO World Heritage Site on the island. There's not much else happening on Praslin, so if you're choosing to stay between Praslin and La Digue (pronounced "La Dee-g"), choose La Digue. See our Guide to the main island of Mahe here.